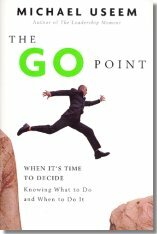 The Go Point -- The Moment of Truth When You Have to Say "Yes" or "No" When It's Time to Get Off the Fence. Michael Useem -- through dramatic storytelling -- shows how to master the art and science of being decisive. He places you smack in the middle of people facing their go point, where actions -- or lack of them -- determined the fates of individuals, companies, and countries. Why on earth did Robert E. Lee send General George Pickett on an almost suicidal charge against the Union lines at Gettysburg? How does the leader of a firefighting crew make life-or-death decisions, directing his people -- with little information about weather patterns to guide him -- to go up or down the mountain? One direction means safety, the other danger. You've just assumed responsibility for a scandal-wracked corporation, a company teetering on the brink of disaster. What you decide over the course of the next several days will have consequences for thousands of employees and investors. How do you fulfill your responsibilities? Michael Useem makes you feel as if "you are there," right in the center of the action. He was there: tramping up and down the mountain where firefighters made their momentous decisions; walking the battlefield at Gettysburg to see for himself just what General Pickett faced before making his ill-fated charge; going into a trading pit where million-dollar buy-and-sell decisions are made that affect fortunes of both the firm and the person making the call. You'll discover why some decisions were flawless, perfectly on target, and others utterly disastrous. Most of all, you'll learn how to make the right calls yourself, whether you're changing your career, hiring an assistant, launching a product, or deciding on a potential acquisition or merger. Smartly written and offering unusual insights into the minds of decision makers such as General Lee, The Go Point will provide the guidance for you to move with confidence when it's your turn to get off the fence.